Please don't walk on new sod.Move in ready! 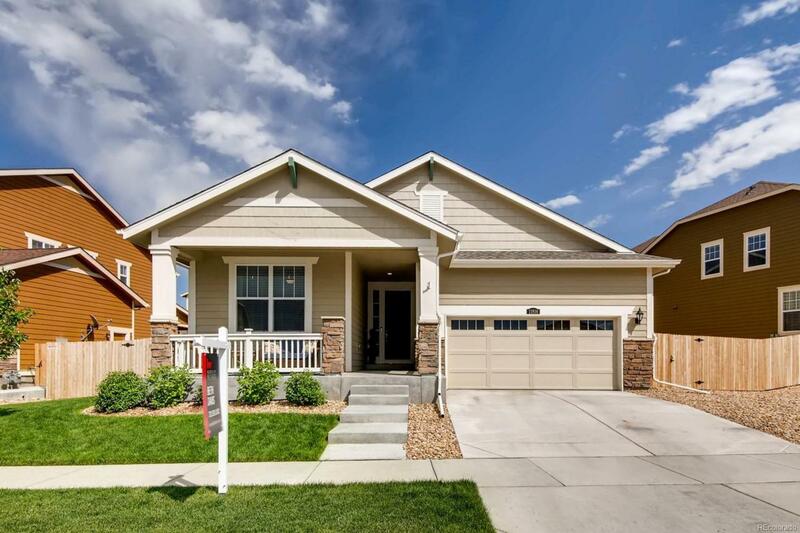 This gorgeous, like new ranch style home home is immaculate. Spacious open concept layout has natural light and beautiful wide plank wood floors wth 9' ceilings.Bright open kitchen features 42" cabinets, stainless steel appliances, granite slab counter tops, large island with breakfast bar and a walk-in pantry. The dining room opens to a covered deck, perfect for entertaining. The master retreat has a lovely 5 piece en suite bathroom with granite counter tops and a walk-in closet. The unfinished basement is a full footprint of the home with 9' ceilings and ample natural light, offering great additional space. Other features include a sprinkler system, water softener and the solar panel program lowers your electric costs. Explore walking trails that are right out the door! Just minutes from Hess Reservoir, H2O'Brien Water park, and downtown Parker with easy access to I25 and C470.